Grohe may not be a name you associate with kitchen faucets, but they do more than just bathroom appliances. Currently they are one of the largest manufacturers in Europe and are slowly but surely making a name for themselves in the American market. This manufacturer is known for providing top end design with the latest technology, and their products prove that. 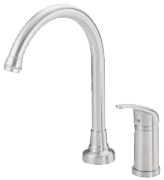 The reviews you will find below prove this company can make a kitchen faucet so it will fit with any type of décor, but at the same-time will last for many years to come. If you haven’t heard of Grohe before, perhaps now is the time.